Wolverine Tools are manufactured with the professional contractor in mind. When you’re on the job you can’t be worrying about your equipment breaking or failing, that is what makes using Wolverine Products a smart move. Don't forget to check out our Pruning Tools and Wheeled Tools. 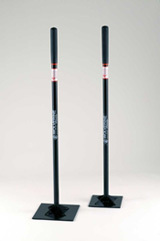 All-Steel Nursery Spade is designed and built to handle almost any job application. From root pruning to bed edging our spades not only stand up to the task, they excel in it. They feature heat treated extra thick blades, mill sharpened blades creating a razor sharp cutting surface, smooth comfortable powder coated handles, pre-drilled holes for optional rubber footpad attachment, closed back, forward step and a 5 year manufacturer’s warrantee. Trenching Shovels by Wolverine are some of the strongest, most durable products while being light weight and easy to handle. These shovels are perfect for trenching for wiring or irrigation, planting small plant materials and cleaning up landscape areas. Wolverine Dirt Tamps are built to last! If there is one tool that needs to be solid, it’s a dirt tamp. This is the one for the job. Contractors Brooms are perfect for cleaning up any mess.